Professor Cindy Johnson of the Biology Department returned this fall after serving in Tanzania for two years as a Fulbright Scholar. While not able to transport the majestic Kilimanjaro Mountain she could see every morning from her backyard in Tanzania, Biology professor Cindy Johnson has brought back many other memorable experiences and fascinating stories from her two years in Tanzania as a Fulbright Scholar. 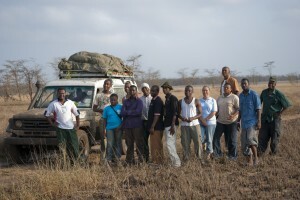 Utilizing her skills and experience in administration, teaching, and research, Johnson helped establish a bachelor’s program and a student advising system at the College of African Wildlife Management at Mweka along with teaching classes and conducting research on conservation issues in Tanzania. The stunning culture and landscape of Tanzania were not new for Professor Johnson. She has been taking Gustavus students to Tanzania since 1996 for January Interim courses. Nevertheless, this trip was special for her and she describes it as life changing. When asked about what she would most like others to know about her time there, Professor Johnson replied that she would wish “for people to know about the complexity and the beauty of places like that, on an ecological and sociological level.” From the way she describes adventurous safaris, interesting cultural traditions, and leisurely runs up Mt. Kilimanjaro, it is obvious that the opportunity was more than simply a smart career choice. Along with involving herself in the Tanzanian culture, Professor Johnson also held important positions within the College of African Wildlife Management at Mweka. She worked with faculty and administrators to improve the conservation biology program there. Cindy Johnson also conducted research, focusing on people-versus-animal issues. Her current project is the completion of her book concerning this subject. When asked why she chose to make such radical geographical and cultural change at this point in her career, Johnson explained that her many experiences in the academic and administrative worlds had prepared her fully to do the tasks required. While Professor Johnson may be back in the United States at the moment, she is determined to maintain strong ties with Tanzania. She has several ideas of how to continue supporting students in Tanzania, including a Tanzanian-United States conservational biology student exchange program. This would enable Tanzanian students to travel to the US to experience firsthand conservation techniques, conflicts and successes. Though she has returned, it is obvious that this incredible experience has left an indelible mark on Professor Johnson and she is passionate about continuing her global work. Gustavus is excited to see where this passion takes her next. Professor Johnson with some of her students on a safari.